Geographical Range: Madagascar, Nairobi, and Kenya. Habitat: Warm and humid costal lowlands, but prefers drier forests. Location in the Zoo: Herpetarium. 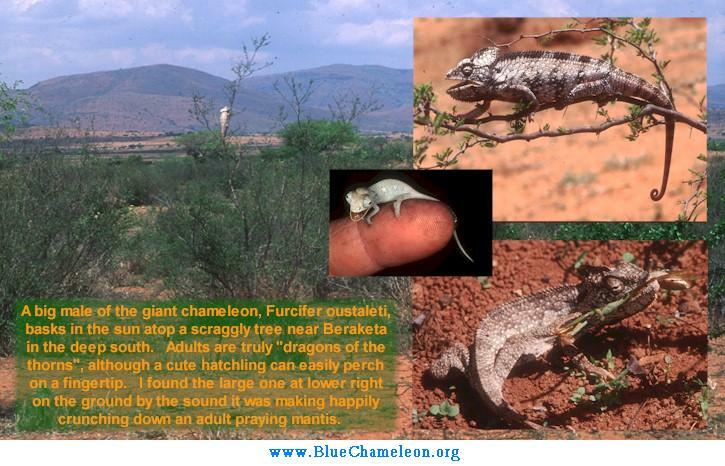 Oustalet's Chameleons are very large. The majority of its size is in length, and reports up to 70 cm are almost common. The prehensile tail can grow up to 1.5 times the body's length, and the tongue can be as long as both combined. The casque that found on top of the head resembles a shield, and changes colors on the front and back sides. The feet grow toes in pairs of twos and threes. The front toes have two on the outside, and three on the inside, but the hind feet are opposite. Hatchlings typically weigh .8 of a gram, and are already adapted with a small version of a casque. Females are typically smaller and more brightly colored than the males. For beginners, reptiles are cold-blooded, so they rely on the sun's heat to keep their blood thin enough to flow through veins. This allows the reptile to eat far less than a mammal of the same weight, useful if the mammal is in competition for food. Next is the skin of the chameleon, which can be divided into four highly specialized layers. The outer layer is a constant cell factory, always repairing broken cells. The scales of the outer layer contain no pores, further economizing the chameleon's efficiency of scarce resources. The next layer, under the scales, contains simple yellow pigments -- hardly special compared to the rest. The third layer contains a magnificent system of particles, each measuring less than .00004 cm, small enough to scatter white light. The fourth layer contains cells, each filled with countless pigment particles named melanin. Hormones from the chameleon cause melanin to either attract or repel one another. When fully attracted to one another, the pigments of the fourth layer are barely visible, and no longer absorbing enough light to make the second layer's pigment subordinate -- you see yellow. When fully repelled from one another, the pigments of the fourth layer seem to occupy the entire cell, absorb the majority of incoming light, and turn very dark. Together, the bottom three cells work to produce all of the colors seen on a chameleon, but the repelling and attracting properties of the fourth layer are behind the entire "color changing" phenomenon. Chameleons are arboreal reptiles. They spend most of their life above ground, in trees and bushes. Because of this, the feet and tail of the chameleons are highly specialized in climbing and balance. The four feet of a chameleon are zygodactyle, in that the toes grow in groups on opposite sides of one another, perfect for grasping around a branch. 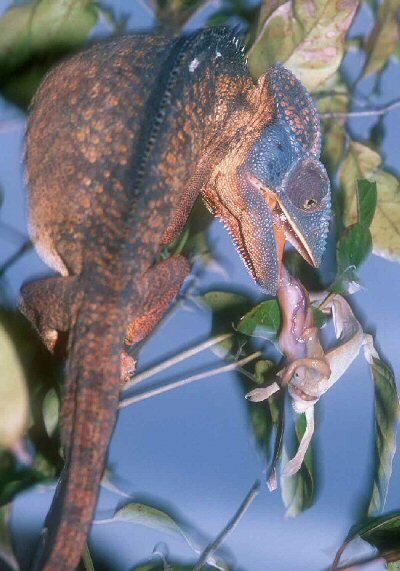 The tail is like a fifth leg in two ways: it is prehensile, so the chameleon can use it to grasp nearly any size branch, and it is heavy, so it can also be used as a counter balance. The tongue of a chameleon is covered with a sticky liquid. It can travel at a speed of 13 miles per hour, and the mechanism propelling it accelerates to 20 feet per second, in 20 milliseconds. The principle that accelerates the tongue works in the same way as a bow and arrow. 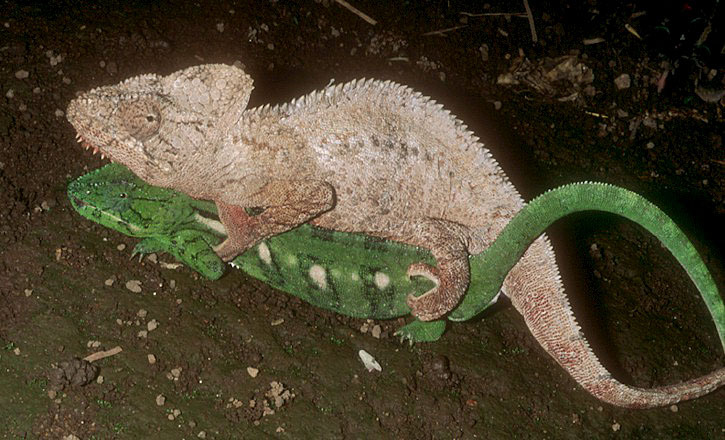 Such an amazing hunting tool allows the chameleon to catch prey much faster than insects. As you can see in the picture, the tongue ends in a suction cup. The speed of the tongue, along with the suction cup at the end, makes the chameleon a successful hunter. And surprisingly, because of the complex camouflage system, this chameleon is also a successful prey. And finally, there is the rudimentary third eye of the chameleon. Found between the developed pair is another eye, not as sensitive as the others, but still useful for detecting shades. The Fort Worth Zoo recently lost their oustalet's chameleon, so instead I will explain some of the behaviors. Exercise is very important to a chameleon, but too much movement can reveal oneself to predators. This is why chameleons can spend great amounts of time motionless or moving very slowly. Movement, to a chameleon, is like a dance. In order to move to better feeding, without being eaten, the chameleon mimics the motions the leaves. By moving in slow swaying motions amongst the leaves, predators can easily pass chameleons up as tree matter. Sexual maturity is reached in 6-12 months. Males have been known to show of a blue color during courtship. The picture above shows the chameleons in a state of agitation. The white colors are possibly caused by fear. The Female may lay a single clutch of 60 eggs, but some are known to lay two clutches in captivity.